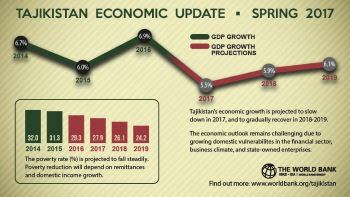 Since 2014, Tajikistan has seen considerable improvements in terms of investment, and has made considerable progress in creating new businesses, obtaining fresh loans, improving its taxation system and implementing cross-border trades. However there are still issues surrounding industrial productivity, a lack of cohesive infrastructure and uncertainty and fragility in the country's business environment which are limiting further progression at the moment. At the present time the Tajikistan government is choosing to direct investment from overseas into the development of new industries at the same time as carrying out modernisations into the country's existing ones. Any private investment is thoroughly screened by the government and requires approval. Tajikistan's total investment has been averaging out at around 15% of the country's GDP each year since 2008, and this is quite low by both international and regional standards. During 2016, the country benefited from an FDI inflow of $434 million USD and this is a huge improvement over the $168 million USD FDI which was recorded three years earlier. Currently, Tajikistan's FDI stock has been estimated at around $2.4 billion USD with energy, cotton and aluminium representing the sectors which are most attractive to foreign investors. Tourism is now also starting to become a more attractive sector for investment, and the country is offering a favourable environment for both cross-border and regional investment. Although traditionally investments in the country in the form of external loans and state-led investment have been from Iran, Russia and China, in today's economic climate, the country has become more open to the prospect of Western European investment as well as investment from the USA and Asia. The main countries that are now investing in Tajikistan include Russia, China, the UK, the USA and Kazahstan. Russia's contributions include investments in the Tajik banking sector as well as in the bulding of medium capacity hydroelectric power plants. In 2016, the country also made a contract with Salini Impregilo, an Italian company, to build a hydroelectric dam for $3.9 billion USD over a period of 13 years. Tajikistan has no laws to discriminate against investors from overseas by conditioning, limiting or prohibiting overseas investment in any of the economic sectors. Article 4 of the country's Investment Law has guaranteed equal rights for foreign investors and local investors alike. Foreigners are permitted to jointly own shares in an existing company with Tajik citizens or other Tajik businesses by created a fully foreign owned company which operates according to the country's laws or by concluding an agreement with Tajik citizens or legal entities which provide for another form of foreign investment. Foreign companies are allowed to acquire assets including securities, shares, and mineral and land usage rights.